Continue reading Raw Fish Is Delish! While raw fish may seem like a strange dinner choice for some, chefs around the world are constantly experimenting with new ways to include raw fish and seafood on restaurant menu’s. Read the post Raw Fish Is Delish! 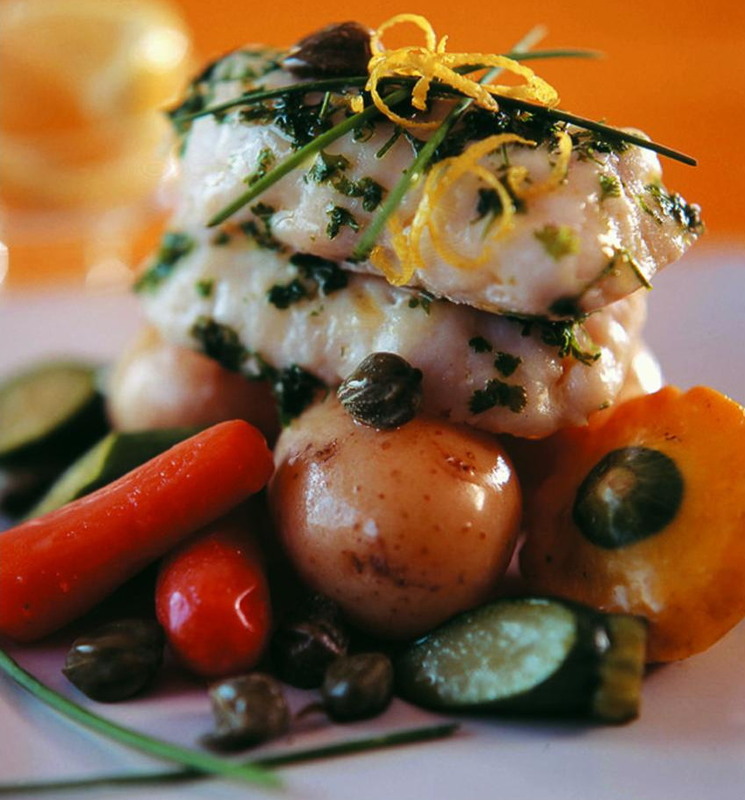 for basic info on the most popular recipes where raw or partially cooked fish is used. The photo’s are guaranteed to convince you to try it at least once! Ceviche consists of slices or cubes of raw fish or shellfish marinated in citrus juice. Seeing that Ceviche is not served raw like for instance tuna tartare, it makes for a great alternative for those who prefer not to eat raw fish. Ceviche is great alternative for raw salmon, tuna, etc. when making poke bowls. The term “tartare” refers to a mixture of chopped raw meat or fish, mixed with seasonings and condiments. Steak tartare and Tuna tartare are the most popular. Gravlax is a traditional Scandinavian dish where a fresh salmon fillet is cured with salt, sugar, and fresh dill. Gravlax is served on rye bread with a dill and mustard sauce. 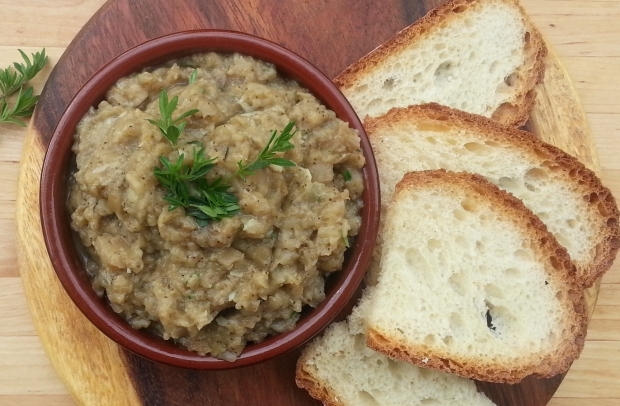 A paté or dip made from the flesh of roasted aubergines with ingredients such as garlic, olive oil, lemon juice and parsley. The paté looks similar to caviar, but does not have the same price tag. Pickled mustard seeds (pictured below) are also known as poor man’s caviar due to its texture which is similar to that of caviar. It is a tongue in the cheek expression for having a rich man’s taste but a poor man’s budget. Pre-heat the oven to 200 º C and line a baking tray with a Wizbake baking sheet. Prick the aubergines all over with a utility knife and place them on the baking tray. Roast the aubergines until it is tender, about 40 to 50 minutes. Larger aubergines will take longer to roast than smaller ones. In the meantime, soak the apricots for 10 to 15 minutes in a bowl of boiling water. Transfer the apricots to a food processor and reserve the water. You might need to add it to the pate if the paté is too thick. Chop the coriander finely and add it to the food processor. Cut each aubergine in half on a chopping board with a cook’s knife and scoop out the flesh with a table spoon. Discard the skin. Add the cooked aubergine flesh to the food processor. Add the rest of the ingredients to the food processor and puree the mixture using a pulse action until it is smooth. Add a little of the soaking water if the pate is too thick. 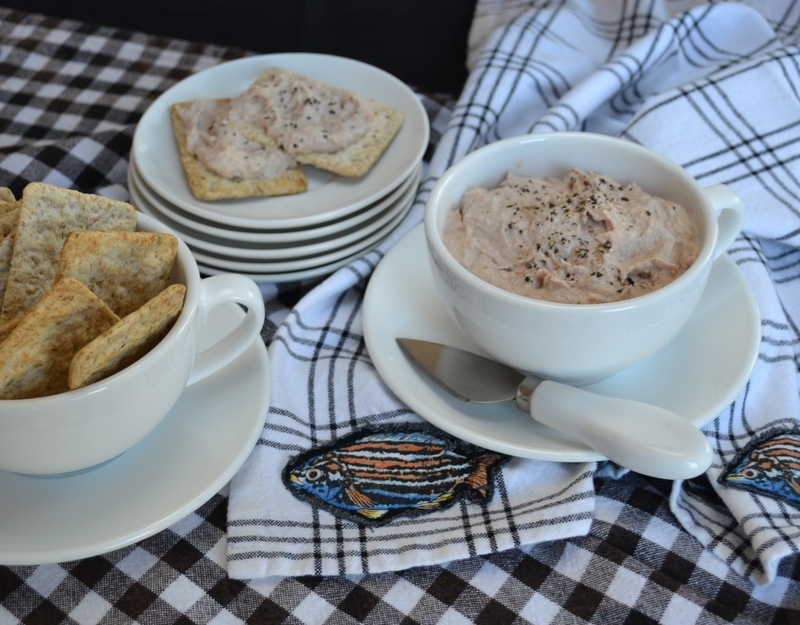 Transfer the paté to a serving dish or container and serve immediately with crackers or fresh bread or use as a spread on a sandwich. Store leftover paté in an airtight container in the fridge for 2 to 3 days. Adapted from Gabi Steenkamp’s recipe. Convenient ingredients are combined to create a superb pate. 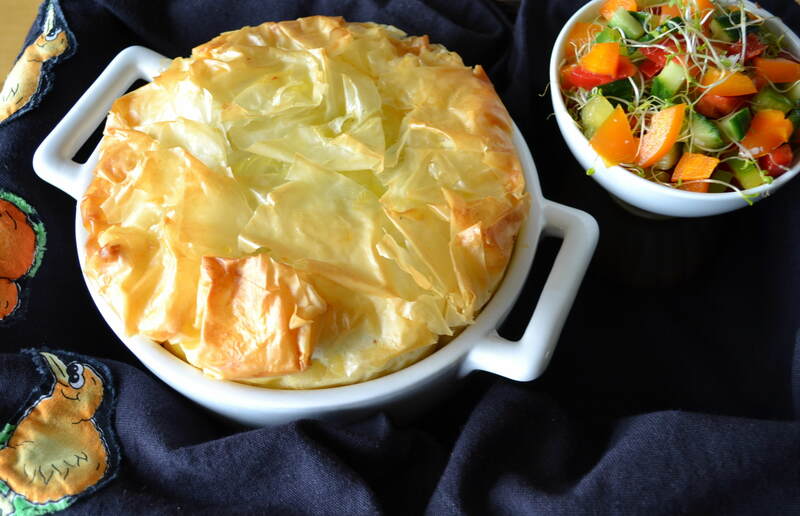 Serve in small ramekins with any crispy bread and sufficient salad garnishes to add a fresh and crisp effect. Place the smoked mussels or oysters with the oil into a food processor, add all the remaining ingredients and blend until quite smooth. Spoon the paté into one large or 8 – 10 individual small ramekin dishes. Garnish with parsley if served soon or smooth the top, cover with melted butter or margarine or seal and refrigerate until the butter or margarine has set. Cover the paté with cling wrap and keep refrigerated up to three days. Recipe by Carolié de Koster from the Art of Cooking Recipe p. 24. It will be hard to outsmart this seafood soup with vegetables which covers two courses of the menu in one bowl! Place the butter in a large saucepan and add the onion, leek, garlic and potato. Stir and cook gently for 5 minutes. Add the water, bay leaf, stock powder, herbs, nutmeg, salt, white and cayenne pepper and bring to boil. Reduce heat and simmer 15 minutes. Remove the bay leaf and blend the soup base with a stick blender until quite smooth. Stir in the cream or coconut cream and remove from heat. Dice the fish and place in a second saucepan with the wine or water. Bring to boil and simmer gently for 5 minutes. Rinse the remaining selected seafood and add to the saucepan. Bring to boil and remove from heat. 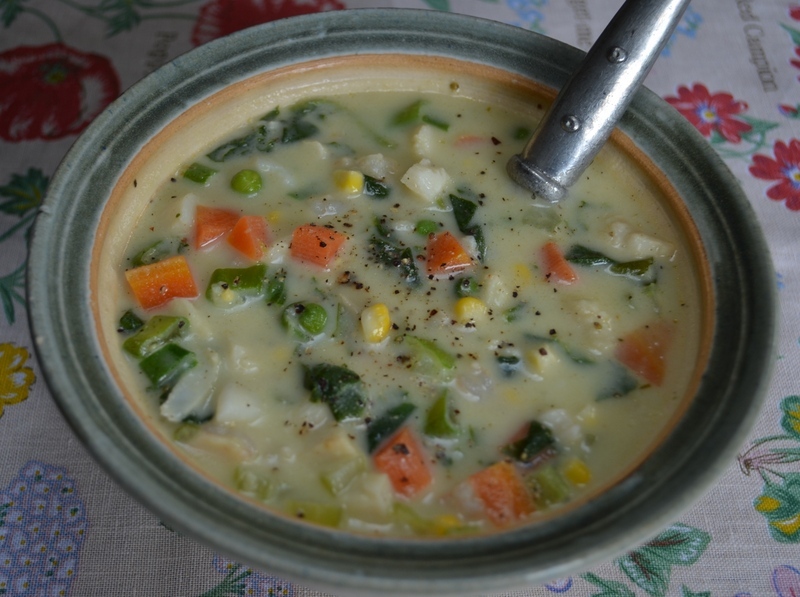 Place the corn, peas, carrot, celery and mushrooms if used in a third saucepan and add the butter. Cook and stir over moderate heat for 5 minutes and add the water. Bring to boil, reduce heat, simmer for 5 minutes and remove from heat. Add the prepared fish, vegetables, spinach and spring onion to the soup base. Stir to combine and reheat over moderate heat until the soup almost starts to boil. Combining microwave and conventional cooking is practical when making a quick supper. Serve with a crisp green salad and fresh bread. Bring the water to a boil on top of the stove in a large saucepan and add a good pinch of salt. Add the pasta, bring to the boil, reduce the heat and boil gently while preparing the sauce in the microwave oven. Place the butter, onion, celery and green pepper into a large bowl and microwave uncovered on High for 2 minutes. Stir and microwave for a further 2 minutes. Add the mushrooms and stir to combine. Microwave uncovered on High for 2 minutes. Stir in the flour and milk and stir well. Microwave uncovered for 4 minutes, stirring at 1 minute intervals. 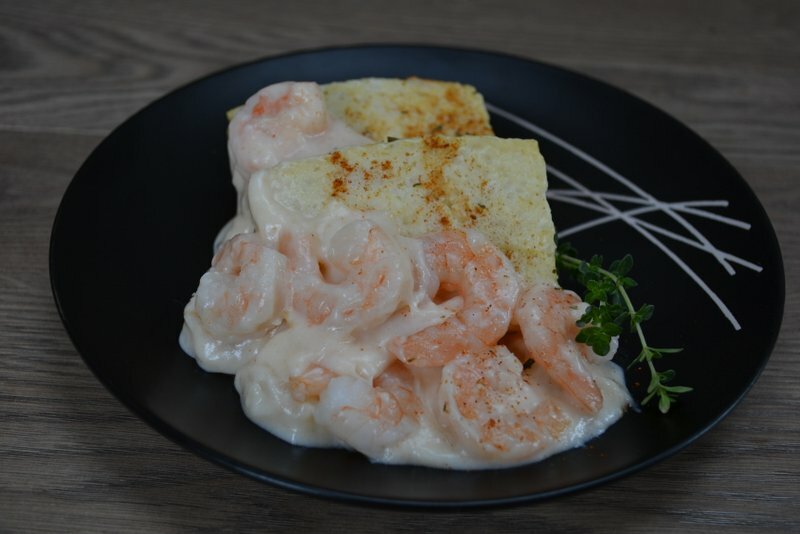 Stir in the lemon juice, salt, Tabasco sauce, cream or additional milk, parsley and half of the cheese and mix well. 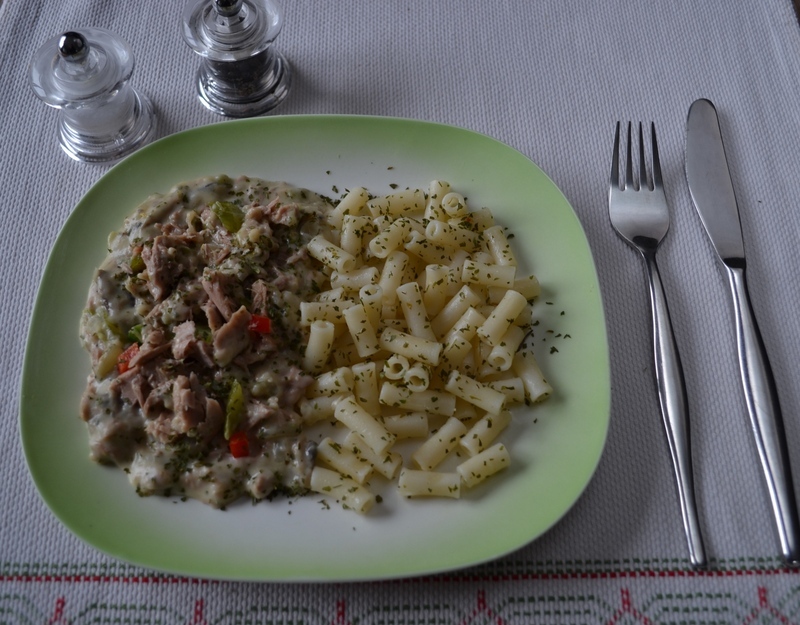 Stir in the tuna and mix lightly – do not break up the tuna too finely. Drain the pasta in a colander and spoon into a round casserole dish of a suitable size. Cover with the tuna sauce and sprinkle with the remaining cheese and paprika. Cover the dish with a lid or cling wrap, leaving an air vent. When ready to serve, microwave on Medium for 10 to 12 minutes or until bubbly and warmed through. Recipe by Carolié de Koster from the Art of Cooking Recipe Book, p. 878. Tempura is an authentic Japanese dish of seafood or vegetables that have been battered and deep fried. Tempura most likely established itself in Japan as a result of the Spanish and Portuguese missionaries and traders, who introduced deep-frying in oil during the late 1500’s. Tempura batter is a light batter which is made from cold still or sparkling water and wheat flour. Eggs, bicarb of soda or baking powder, oil, and/or spices may be added to the batter. Tempura batter is traditionally mixed in small batches using chopsticks for only a few seconds, leaving lumps in the mixture that, along with the cold batter temperature, result in the unique fluffy and crisp tempura structure when cooked. The batter is often kept cold by adding ice, or by placing the bowl inside a larger bowl with ice in it. Also see the recipes for Best-ever Batter-fried Fish and Batter-fried Calamari Rings for other types of batters. To make the batter, combine the cake flour, corn flour and salt in a large mixing bowl. Add the water a little at a time while stirring, until the batter has a medium consistency – it must look a little thicker than buttermilk. Do not worry about the lumps. Set it aside. Place the prawns in a colander, rinse well and pat dry. Pour oil to a depth of 5 cm in a large saucepan and heat to moderately hot. When the oil is ready, add a few of the prawns to the batter and stir to coat well. Lift the prawns out of the batter with a slotted spoon and allow the excess batter to drip off. Slowly lower the prawns into the oil. It is important to fry the prawns in batches to ensure that the temperature of the oil remains constant. Do not overcrowd the pan. Fry the prawns until golden and crisp on all sides. Remove the tempura from the oil with a 2nd slotted spoon and transfer it to a plate lined with absorbent kitchen paper to get rid of the excess oil. Transfer the tempura to a serving dish and set aside. Do the same with the rest of the prawns. Cover the dish with foil and reheat in a preheated oven at 160 ºC until warmed through. The batter can also be used to coat skinless and boneless fish steaks that has been cut up into bite-sized pieces, or calamari rings. Also fresh vegetables such as onion cut into rings, green beans, red, green or yellow sweet pepper, julienned carrots, etc. The fish or calamari must be thawed. Caesar dressing, whether store-bought or homemade, is a glorious thing. Its garlicky, cheesy, and with the unmistakable anchovy flavor and creamy texture it is the key to one of the best classic salads around. But if it’s so good, why limit it to only salad? In fact, why not use it to make a variety of other dishes infinitely better? 1. Use it as a marinade for meat. Toss chicken in Caesar dressing and let it refrigerate for a few hours or overnight. Then grill or roast to your heart’s content. All the garlicky goodness of the rich dressing soaks into the meat while tenderizing it and making it ridiculously moist. 2. Toss it with vegetables before roasting. Pick your veggies — broccoli, cauliflower, root vegetables, and potatoes all work well — and then toss them with dressing instead of olive oil and roast until they’re extra-caramelized and crispy. 3. Use it as a dip for crudité. Just like crisp lettuce loves Caesar dressing, so does just about any other raw vegetable. Pour it in a little bowl and get dunking. 4. As a dressing for pasta or potato salad. If you’re making pasta or potato salad, ditch your usual dressing and use Caesar instead. It’s thick enough that it will coat every inch of your ingredients and instantly boost the flavor. 5. Spread it on a burger bun or sandwich bread before assembling. Forget plain ol’ condiments like mustard or ketchup and slather Caesar dressing on your burger bun instead. Or spread it on your bread before making pretty much any sandwich — it plays well with turkey, ham, roast beef, and any mix of veggies. 6. Use it instead of mayo for tuna or chicken salad. Caesar dressing makes for a much more interesting tuna or chicken salad. 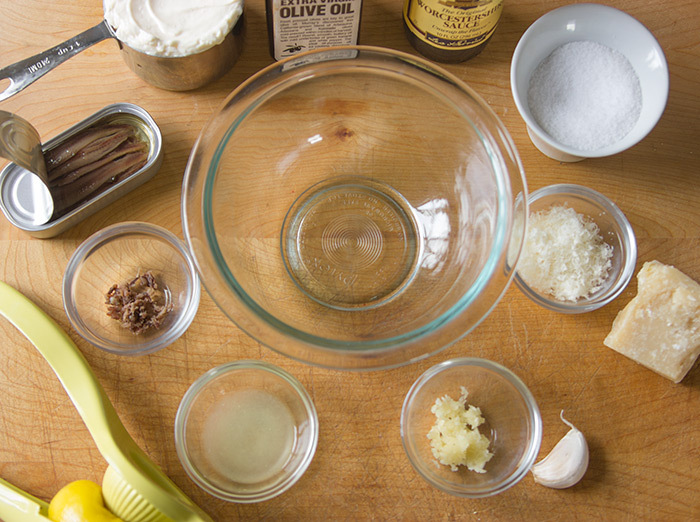 Replace the mayo in any recipe with it and it will be one you actually want to eat. 7. Make a better coleslaw. Just like for pasta or potato salad, using Caesar dressing for coleslaw is a win. It adds instant flavor and brings that touch of richness that coleslaw desires. Try it instead of mayonnaise or buttermilk next time and you won’t be disappointed. 8. Spread it on fish before baking. Use Caesar dressing as a quick and flavorful sauce for fish fillets like salmon or cod. Just spread some evenly over the top of each piece and bake as usual. 9. Drizzle it over corn on the cob. Corn on the cob is wonderful with nothing more than a little butter and salt, but try switching up your routine next time by drizzling a little Caesar dressing over the cooked ear. Combine all the ingredrients in a mixing bowl and whisk until smooth. Recipe from the Nordstrom Marketplace Cafe. 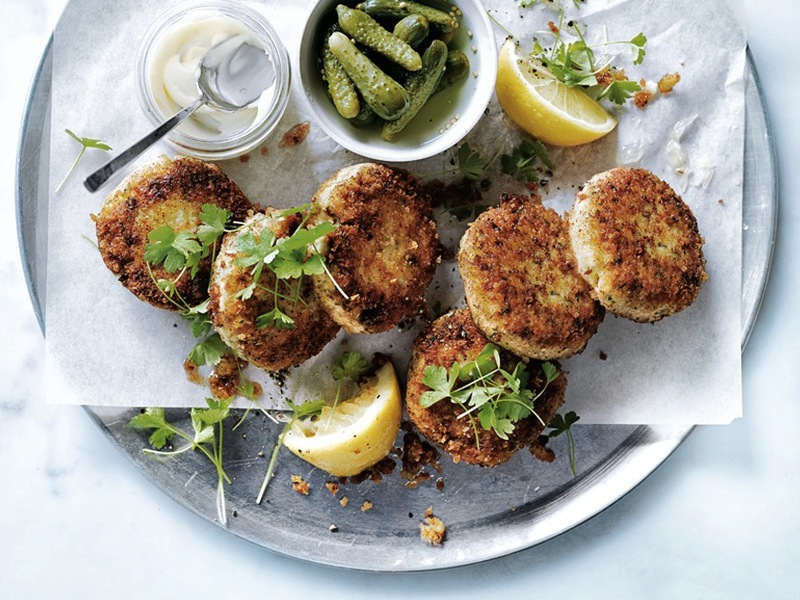 This recipe gives a contemporary twist to seafood dishes with trendy ingredients available in most quality supermarkets (such as Seven Seas Fisheries). The flavour and texture of fresh mango is preferable but if it is out of season, canned mango may be used in the salsa. I omitted the rice and served the prawns and mango salsa on a bed of fresh basil leaves. Place the prawns in a colander, rinse well and pat dry. Add to a bowl with the marinade ingredients, toss and refrigerate for at least 30 minutes. Mix together the ingredients for the mango salsa, spoon in a blow, cover and refrigerate until ready to serve. Toss the hot cooked rice with the flavouring ingredients and keep warm until the prawns are roasted. Pre-heat the oven to 230 º C. Arrange the prawns in a single layer in a roasting tin lined with a Wizbake baking sheet and sprinkle lightly with salt and pepper. Place in the oven and roast for 5 minutes. Turn over, season lightly and roast for a further 3 to 5 minutes or until the prawns are pink and curled. Make a bed of rice on a large platter, arrange the prawns on top and place the bowl of salsa in the center of the platter. Or, if individual plates are arranged, press the rice firmly into small greased moulds for form timbales and unmould onto each plate. Surround with the prawns and spoon salsa on the side. Recipe by Carolié de Koster from the Art Of Cooking recipe book p. 183. 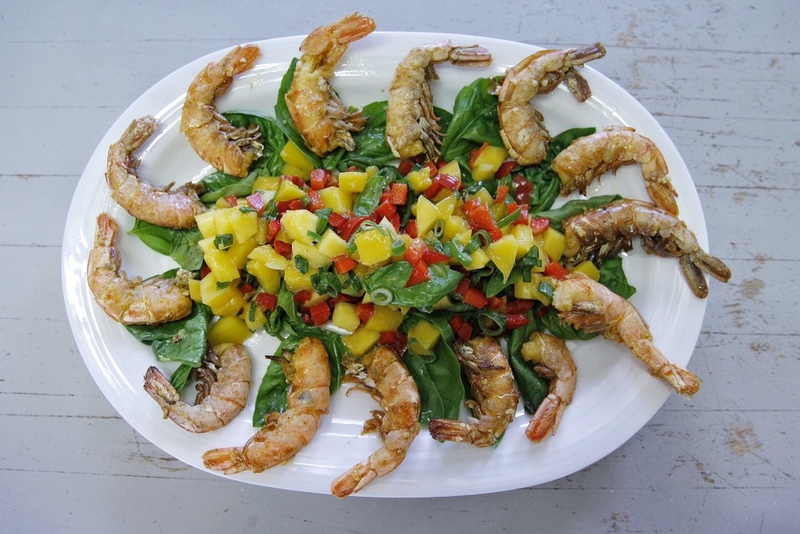 Oven-roasted prawns on a bed of basil leaves with mango salsa. Photo by Christina Holt. 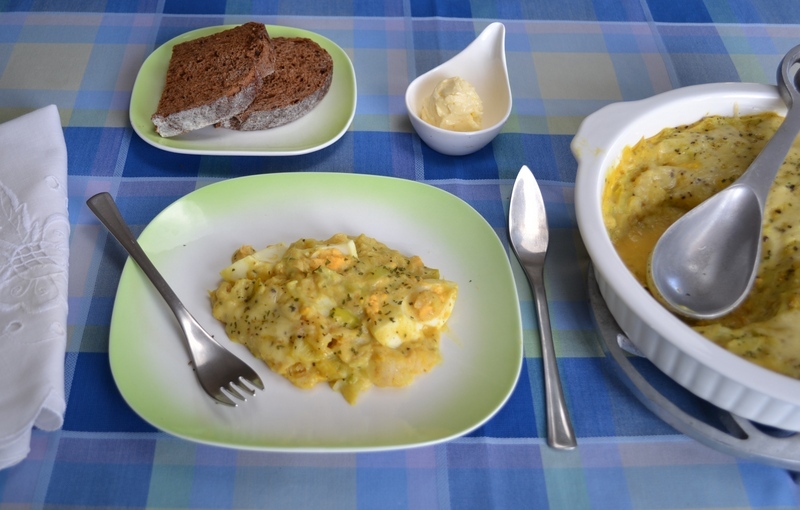 A good dish with eggs to prepare a few hours ahead of time and bake shortly before serving. Place the butter, leek/onion/spring onion in a large saucepan and saute gently until softened. Stir in the curry powder, origanum, cake flour and milk and bring to the boil, stirring with a whisk, until a smooth sauce is obtained. Reduce the heat and simmer the sauce very gently for 5 minutes. Stir in the vinegar and sugar and season to taste with salt and pepper. Pour one third of the sauce into a medium-sized ovenproof dish (1.5 liter capacity) and arrange the halved eggs cut side down on the sauce. Sprinkle the flaked snoek over the eggs and cover with the remaining sauce. Sprinkle the cheese over the sauce, bake at 160 ° C for 8 to 10 minutes or until just heated through and bubbly. Serve with fresh or toasted bread and grilled tomatoes flavoured with mixed herbs, salt, pepper and a pinch of sugar. Recipe by Carolié de Koster from the Art Of Cooking Recipe Book p.121. 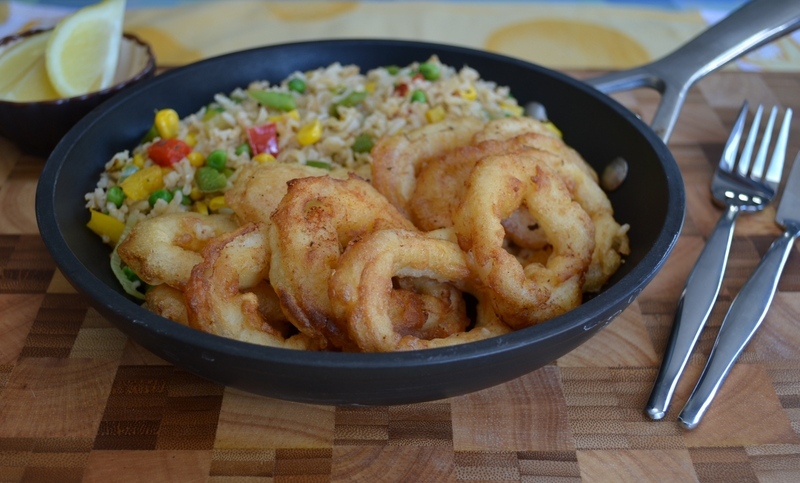 Purchase the largest calamari rings available for the neatest end result. The tenderness of the calamari is often unpredictable but allowing the rings to thaw completely, frying only until cooked and adding salt after frying will prevent them from becoming tough. Be sure to try the recipes for Prawn Tempura (Batter-fried Prawns) and Best-ever Batter-fried Fish for different types of batter. If the calamari rings are frozen, place in a colander and rinse well to remove ice particles. Drain and wrap in a cloth towel for a while to thaw completely and become quite dry, thus reducing spattering while frying. Dust with corn flour so that the batter adheres to the rings. Combine the flour, salt, egg and sufficient water to obtain a relatively firm batter and add the rings to the batter. Stir to coat well. Pour enough oil into a deep saucepan to fill it to a depth of about 50 mm and heat to moderately hot. Lift our the rings individually, drain off the excess batter and drop a few rings at a time into the oil. Fry for 1 to 2 minutes to a side until pale golden and crisp, keeping the saucepan partly covered or cover with a perforated lid to prevent excessive spattering. Remove the saucepan from the stove plate before lifting the lid when turning over the rings. Remove the fried rings from the oil with a draining spoon, drain on absorbent paper and keep warm until all the rings have been fried. Serve as soon as possible to ensure tender rings in a crisp batter. Arrange the rings on a bed of buttered or Parsley Rice and add lemon wedges and salad. To create a bountiful Italian seafood platter, combine the calarami rings with peeled, de-veined prawns, mussels, firm white fish fillets cut into strips, or any fresh seafood that is available. Recipe by Carolié de Koster from the AOC recipe book p. 179. A fish cake is similar to a croquette (see the recipe for Potato Croquettes here), consisting of a filleted fish and potato patty sometimes coated in breadcrumbs or batter, and fried. The fishcake has been seen as a way of using up leftovers that might otherwise be thrown away. Peel and dice the potatoes and transfer them to a saucepan. Add the water and salt and bring it to the boil. Reduce the heat, cover and simmer until the potatoes are tender and dry. Add the salt and butter and mash the potatoes very well. Transfer the mashed potato to a medium mixing bowl and set it aside. Add the drained tuna, spring onion, salt, egg and cake flour mix well. Set it aside. To prepare the crumb coating measure the cake flour and spices onto a large plate. Break the egg into a soup plate and add the water. Mix well with a fork. Measure the breadcrumbs (see note) and transfer it to a 2nd large plate. Divide the mixture into 8 equal portions and form each portion into a neat pattie or cake with floured hands. Coat each fish cake with the flour mixture, then dip it in the egg mixture and lastly coat it with bread crumbs. Transfer the fish cake to a Tupperware container and set it aside. Do the same with the rest of the fish cakes. Seal the container airtight refrigerate for 15 minutes. To fry the fish cakes, pour enough oil into a saucepan to cover the bottom of the pan and heat the oil to moderately hot. Fry 4 fish cakes at a time in the oil until light golden brown on all sides. Lift the fish cakes out of the oil and transfer it to a plate lined with absorbent kitchen towel. Transfer the fish cakes to a serving dish and serve immediately or re-heat covered with foil in the oven at 160 ° C for 10 to 15 minutes. Serve with couscous or pasta and condiments such as sweet thai chilli sauce, tartare sauce, etc. To make fresh breadcrumbs, process stale slices of bread into crumbs in a food processor. Freeze leftover bread crumbs for use in another recipe. Substitute the tuna with tinned salmon or crab. Be sure to remove any skin and bones before you mix it with the rest of the ingredients. Cooked and flaked white fish can also be used. To bake the fish cakes in the oven, spoon heaped spoonfuls of the mixture 2 cm apart on a baking tray line with a Wizbake baking sheet. Use the back of the spoon to flatten the heaps into patties. You can also use cupped hands. Bake the fish cakes for 10 to 15 minutes until both sides are golden brown. Tilapia, also known as St. Peter’s fish, is mainly freshwater fish inhabiting shallow streams, ponds, rivers and lakes. Tilapia is popular because it is a mild flavored, white-fleshed fish that is available throughout the year at a competitive price. The most popular product form is skinless and boneless fillets. Add the Orzo or Risoni and cook until al dente, about 8 minutes. Combine the tomatoes, parsley and 15 ml of the olive oil in a mixing bowl and stir to combine. Taste and add salt and pepper as needed. Set aside. While Orzo or Risoni cooks, place the flour on a plate and season with salt and pepper. Season the Tilapia on both sides with salt and pepper as well. Add the Tilapia to the flour and dredge, pressing to adhere on both sides. Shake off any excess. Heat 100g butter and 15 ml olive oil in a medium saucepan over medium-high heat. When the butter is foamy, add the Tilapia and cook until opaque and flakes easily, 2 to 3 minutes per side. Transfer to a serving dish and set aside. Add the white wine, capers, and juice of 1 lemon to the pan in which you cooked the Tilapia and cook over medium heat for about 30 seconds to warm through. Remove the pan from heat and stir in the remaining butter to melt. 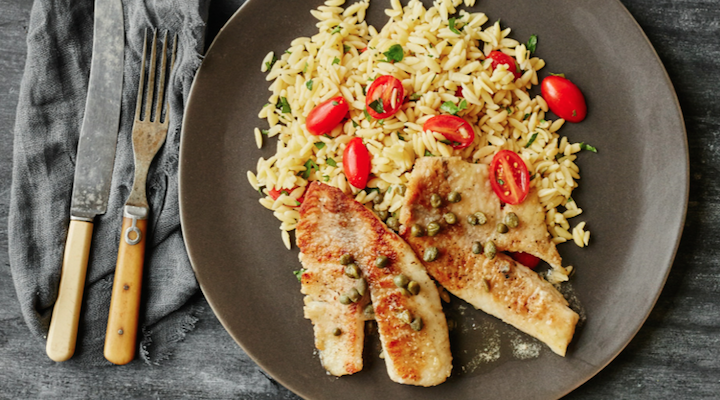 Divide the Orzo or Risoni and tilapia evenly between 2 plates. Pour the sauce over Tilapia and serve. This simple, yet mouthwatering recipe demonstrates how well suited microwave cooking is to fish – minimum effort for maximum enjoyment. Select a round dish which will hold the fish comfortably and grease well with butter. Sprinkle the fish lightly with salt and arrange into the dish. If the fish is frozen, cover the dish with clingwrap and microwave on High for 5 minutes to defrost the fish. Combine the butter, lemon juice, garlic, parsley and capers in a small jug and microwave on High for 1 minute. Stir well, pour over the fish and sprinkle generously with black pepper. Cover with clingwrap and microwave on High for 7 minutes or until the fish flakes easily. Allow to stand for 5 minutes, spoon the sauce over the fish and serve with boiled baby potatoes and salad or vegetables. Recipe by Carolié de Koster from the Art Of Cooking recipe book p. 876.